Last week I raised the question of atonement. Reconciliation or an instance of reconciliation between God and humans. Atonement Christianity. The reconciliation of God and humans brought about by the redemptive life and death of Jesus. Is this something you are REALLY convinced of? We accept easily that Jesus paid the price for our full salvation. We cannot prove this in all its fullness until we meet Him but we accept it utterly – Why? As you know scripture makes it clear – see last week that “we have been healed” – passed tense. 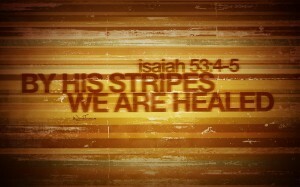 In the Old Testament it was a promise of God – I am the God who heals you. But in the NT “we have been” 1 Peter 2:24…look that up please! Note : Do not simply read them through once…as though it is something you already know all about . Read them several times…feeding on the revealed truths and the challenges. Q: Do you REALLY believe that all are healed -NOW – but it is just not manifest? – This is a REALLY big one! Q: If not why not? Q: Either is true universally or it comes with conditions. What do you think?